With a stature similar to the MicroBrute and other diminutive machines in Arturia's growing line of hardware synths, the brand-new and altogether unique MicroFreak is here to keep the French brand charmingly off-kilter. 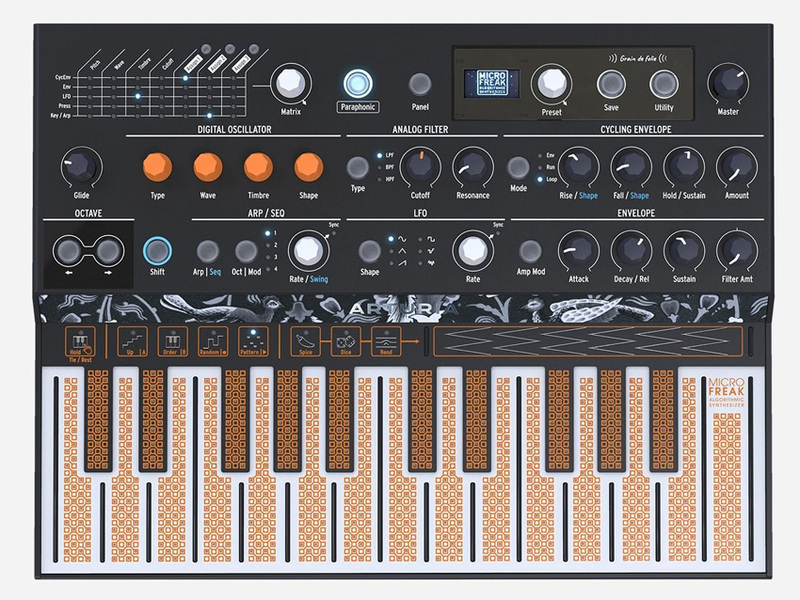 Arturia has given the MicroFreak the tagline of "un grain de folie," or a grain of madness, and its digital oscillator, analog filter, touch-keyboard, a 5x7 modulation matrix, and the ability to store up to 192 presets all seem to be crafted for strange sonic adventures. Retailing for just 299€ (roughly $340 USD), the MicroFreak is an affordable option for beginners as well as experienced synthesists. The digital oscillator has a number modes that Arturia says "other synths simply wouldn't consider," including Texturer, KarplusStrong (a plucked string-like sound), and Superwave, along with FM, Wavetable, and more. From that sound source, you can treat the sound with an state variable analog filter that takes its cues from the Oberheim SEM filter. The 5x7 modulation matrix includes three user-assignable destinations, and the touch keyboard, which features an etched surface, comes complete with polyphonic aftertouch capabilities. The MicroFreak includes an arpeggiator and step sequencer, with the ability to "record up to four automations, edit notes per step, or use innovative randomization options." With a host of I/O options, the synth plays well with others. Connect to other parts of your rig through USB, MIDI, Clock In and Out, or the CV/Gate's Pitch Out, Gate Out, and Pressure Out. You can order your MicroFreak on Reverb now. For all the latest product releases straight from the NAMM 2019 convention floor, check out our ongoing coverage.